When Chinese leaders met in Beidaihe for a retreat in August, the threat of an emerging trade war cast a shadow over what should have been a euphoric celebration of a new era under Xi. A few days before the meeting, Trump had announced intentions to put tariffs on another US$200 billion, more than a third of total US imports. Had Xi aggravated the conflict with overconfidence? According to Financial Times, a prior Politburo meeting had stressed “stable employment, stable finances, stable foreign trade, stable investment and stable expectations” while at Beidaihe a politburo member urged the country’s leading scientists to “have a patriotic heart” and help China “independently control key technologies.” Made in China 2025 was a patriotic matter of the heart. Realities stood against ambitions. In Trump’s world view, there is no international system, only bilateral transactions. He has displayed almost pathological desire to overturn every accomplishment of his predecessor, President Barack Obama. He rejected the Trans-Pacific Partnership agreement with 11 other Pacific nations even though it pointedly excluded China. In accordance with this logic, Trump has made trade deficits a key issue, describing these as a measure of how much countries in question have “taken” from the United States. Nobel laureate economist Joseph Stiglitz’s explanation is blunt: “The United States has a problem, but it’s not with China. It’s at home: America has saved too little” – borrowing and importing too much. Trump also ignores that a large part of US imports consists of goods and components manufactured by US companies operating in China. An explanation of China’s success is the large inflows to the country of foreign investment and foreign technology. China, since its era of “reform and opening” was launched 40 years ago, has taken a giant technological leap that would have been impossible without integration into the global economy and complex production chains. Appealing to patriotism, Trump wants to destabilize the Chinese economy and in August declared that the tariffs worked “big time.” He triumphantly noted that Shanghai’s stock market fell by over 20 percent in six months while US exchanges hit new records. Earlier in spring, Trump’s focus was on steel and aluminum. Few could have imagined that Trump would also announce tariffs, with reference to the country’s security interests, on steel imports from the European Union and NATO-allied Canada. Still, China clearly is the main target of Trump’s offensive. The problem is that China has succeeded too well, with methods increasingly questioned. Within the EU, there is growing criticism of China’s actions and concerns about strategic Chinese acquisitions of European companies and technologies. The Trump administration maintains that China’s success is based on stolen technology, unfair commercial practices and cybertheft. Patents, intellectual property rights and innovation capabilities are the heart of this drama. The Trump administration hopes to curb China’s increasingly threatening technology development, symbolized by Made in China 2025, the country’s commitment to lead the fourth industrial revolution. China’s advances in robotics, driverless cars and biotechnology are increasingly evident, and in artificial intelligence, China is on its way to becoming a world leader. The United States considers the World Trade Organization of no use for limiting China’s technological development. Trump has threatened to pull the United States out of WTO “If they don’t shape up.” According to The New York Times, Trump’s national security adviser John Bolton has defined US exit from the WTO as a strategic goal though Congress does not support such action. China, on its part, seeks WTO backing. Thus, the economy is both China’s strength and Achilles heel. Measures taken in 2017 to contain credit expansion are now scaled down due to concerns about the trade war. A more expansive policy is considered necessary. A goal not to allow the Chinese currency to fall below seven yuan per dollar could be expensive. 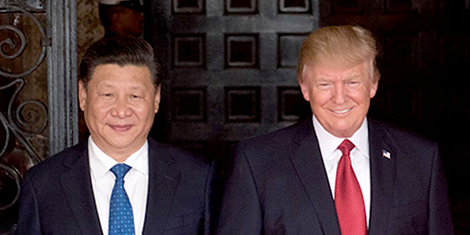 Börje Ljunggren is a former Swedish ambassador to China and author of The Chinese Dream – Xi, Power and Challenges”(2017), published in Swedish.